Villages/cities will visually change as holidays based on TES lore come and go. NPCs will also react to these changes by attending various events appropriate for the holiday. Everyone that has contributed to uesp.net for holiday lore. Zaf for contributing his voice to the Feast of the Dead. mindboggles for modification and use of Fireworks. mannygt for modification and use of Christmas Lanterns. Oaristys for various models from Modders Resource Pack. Blary for the note meshes from OpenBooks Resource. Deandra, Yughues and Tamira for modification and use of pumpkins: Halloween In Skyrim - Even More Pumpkins. Vicn for various masks from The Mad Masker. volvaga0 for the bandanas from Bandanas of Skyrim. princess_stomper for the Skyrim adaptation of Dickens' A Christmas Carol. DanielCoffey for book resources from Better Book Mesh and Book Covers PSD. Phoenix Amon (Daleth), without Book Jackets: Oblivion the Book Covers Skyrim mod would not exist. Grimbot for Grimbots DLC Book Jackets for Oblivion. Metallicow for his book textures and his resources. www.fuzzimo.com for the Free Stock worn fabric book cover textures. css0101 and hifoo for their lanterns from Nordic Lantern - Replacer and Usable Lantern. Holidays has been completely rebuilt with performance in mind. It is also now a standalone mod. Wet and Cold is no longer required. Instead of checking the date and disabling/enabling markers every hour, this mod now checks the date once per day. If the date coincides with a holiday, only then will additional scripting become active. This change also keeps effect conditions from polling on the player and NPCs unless a holiday is active. Innkeepers now have dialogue indicating free rooms when Heart's Day is active. Merchants now have dialogue indicating discounts when the Warriors Festival or Merchant's Festival is active. The Tales and Tallows dead have a new sound effect. You can now randomize or manually set your starting date through the MCM at the start of a new game. Fixed an issue where "A New Life Carol" books could not be found during the Saturalia holiday season. These books can now also be found outside of the holiday season but are much rarer during that time. Made many minor fixes and tweaks. SKSE is only needed for the Gear functionality to work and configuration of this mod through SkyUI's MCM. Villages/cities will visually change as holidays based on TES lore come and go. NPCs will also react to these changes by attending various events appropriate for the holiday. 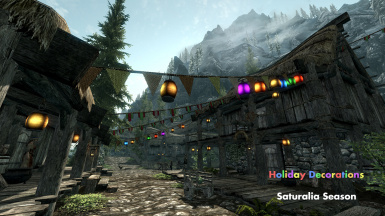 If you'd like to experience the in-game holidays along with the real world, it is possible force any holiday, any day, for as long as you'd like through the MCM. 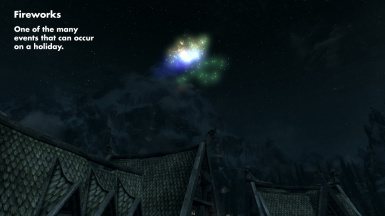 From festive lanterns to fireworks, a list of currently implemented holidays and their basic effects in-game can be found here. You will be given notice of upcoming holidays through flyers from the courier and/or through a monthly events letter at the bar in each city tavern. NPCs will equip various items depending on the holiday. Currently implemented gear: Saturalia hats during Saturalia, Jester's Day costumes during Jester's Day, New Life Bandanas during the New Life Festival, Festival of Lights Candle Lanterns during the Festival of Lights and practice weapons during the Warriors Festival. A city's/village's NPCs will celebrate in temples, shops, inns and/or outside depending on the holiday. Merchants/laborers may retire early in order to attend events. 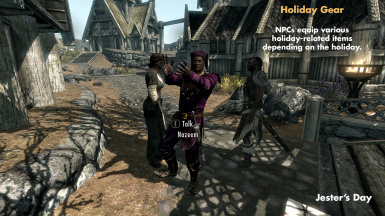 All cities and villages in Skyrim will have NPCs who celebrate provided the settlement has the specific location required for the holiday (e.g. the Mid Year Celebration has NPCs gathering in temples and outside that day. Since Riverwood does not have a temple, Riverwood's NPCs will only celebrate outside on this holiday). Since this feature may interfere with some NPC quest scenes, you can A. bother them later (let them relax it's a holiday!) or B. temporarily disable this feature when needed. If starting a new game, you will have the option to manually set (requires SkyUI and SKSE) or randomize the month, day and/or time your adventure begins. Compatible with Alternate Start - Live Another Life, Skyrim Unbound and Random Alternate Start. 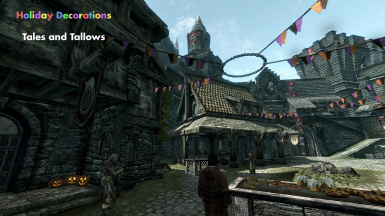 A "Festivals of Skyrim" book detailing all non-dynamic holidays in this mod has been added to the book clutter leveled list. It has a low chance of appearing in various locations throughout Skyrim but will be freely given if SkyUI and SKSE are not installed. Saturalia decorations will appear on Whiterun's Gildergreen only when it is fully grown and healthy. "A New Life Carol" book series (5 total) are a Skyrim adaptation of Dickens' "A Christmas Carol" by princess_stomper and are more likely to be found during the Saturalia holiday season. After the Battle of Whiterun, this mod will be disabled until the civil war is completed. However, this can be overridden using the override feature at your own discretion. All times listed are estimates. NPC travel time should be taken into account. Using the Wait function to pass time until an event occurs tends to cause NPCs to bunch up in one location. Allowing NPCs to arrive naturally results in a more natural dispersion. Winterhold does not hold any celebrations. 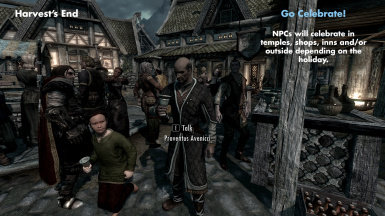 No NPCs are directly modified making this mod fully compatible with all NPC mods. Since the primary aim of this mod is to make use of the in-game population, it is highly recommended that you install mods which will populate your Skyrim. NPC AI packages from Wet and Cold, Run For Your Lives and When Vampires Attack will have priority in the event that NPCs seek shelter. There may be some minor clipping with the decorations if any other mod that modifies cities or villages is installed. Mods that make drastic changes will result in more severe clipping and floating decorations. A compatibility patch for Open Cities is available. This patch must be placed under "Open Cities Skyrim.esp". "Holidays.esp" must be placed somewhere before "Open Cities Skyrim.esp". When uninstalling, make a save with no holidays active and then remove all installed files. Make sure Holidays.esp and .bsa are no longer present in your Data folder.